Have you always wanted to improve your Chinese but never found the time? Look no further! Hutong School in Beijing offers a wide range of Chinese language classes catering to your needs. Having been awarded That's Beijing Readers' Choice for "Mandarin School of the Year" for three years running, we're confident that whether you're looking to get by in Beijing and buy groceries, have a chit-chat wit your neighbor, obtain full professinal working proficiency or even pass the HSK 6, we can help you achieve your goals! Our innovative teaching method is designed to suit Western learners by separating oral Chinese from character recognition, to enhance the speed of your learning process. As every person is different, we assess your learning goals before starting your classes with us to construct the right teaching plan for you. And take part in many of our free cultural activities! “Great school for all levels of Chinese. Excellent environment, well-trained teachers and very helpful staff. Look no further.” Andrew F.
We offer a wide range of Chinese courses, to help you meet your goals. Whether you prefer to learn in a group or individually, we have a course for you! As a Hutong School student, you will also have the chance to join our frequent cultural activities that give you an insight into various aspects of the Chinese culture and history. These include calligraphy classes, arts & crafts workshops, trips in and around the city and more! Because personalized teaching is the key to fast and effective results, we limit our group classes to an average of 4 or 5 students per class. If you prefer to study at your own pace and get the teachers' full attention, take advantage of our 1-on-1 sessions. Contact us to design a special training course tailored to your business sector. We also offer free weekly tutorial sessions to give each of our students personalized feedback on their progress and provide them with learning tips. “I took classes at Hutong School as part of a small group. Our teacher was fantastic. My general impression was that Hutong School is serious about providing top-notch education and generating some really satisfied customers.” Frederik G.
Our Mandarin school in Beijing is located in the heart of Sanlitun, close to the Central Business District. The school is in a convenient location for the many expatriates who work and live in Beijing, as well as for students learning Chinese or doing an internship. Find us on the 15th floor of Zhongyu Plaza. Right accross Sanlitun Village (Taikoo Li Sanlitun). 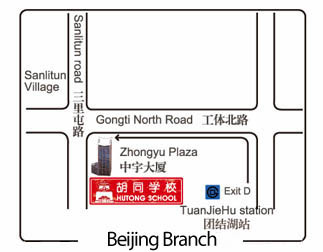 By Metro: take line 10 and get off at the Tuanjiehu Metro Stop, exit D. Walk about 500 meters west on Gongti Beilu. You will find us at the first intersection on your left hand side. By car: from the 3rd ring road, turn west at the intersection between the 3rd ring road and Gongti Beilu (Changhong Qiao). Drive about 500 meters west on Gongti Beilu. You will find us at the first intersection on your left hand side. Contact us or call (+86) 10 8523 6030 to get started! Just come by and say "Nǐ hǎo" and enjoy a Free Trial Class!